“Don’t worry, it’s going to be good,” I said. “No, really,” I said as I started grating the second zucchini, at which point she burst into tears. “It’s going to be disgusting!” she cried, and couldn’t be convinced otherwise until I let her taste the batter, when she quickly changed her mind. But I can understand her confusion. Zucchini bread is about as American as apple pie, but the idea of using them in baking is practically unheard of in Ireland. 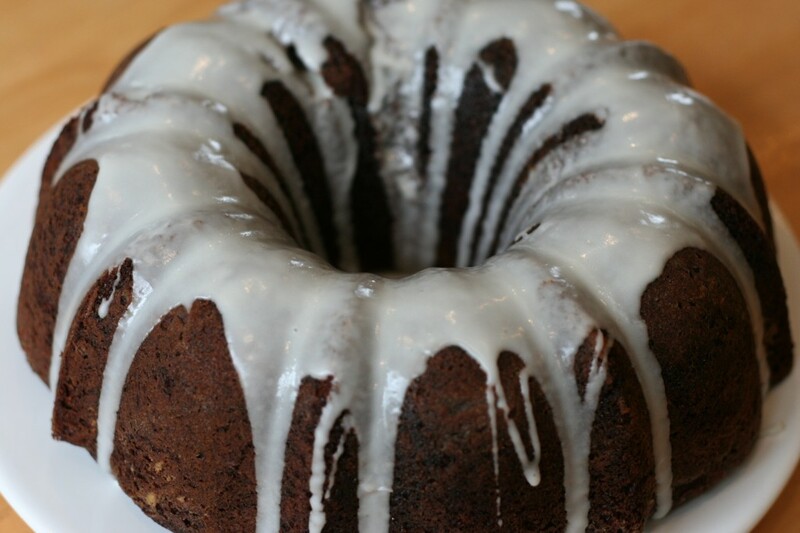 The zucchini in this cake simply adds moisture and soaks up the cocoa. Not only can you not taste it, but you actually can’t even see it either once it’s baked. Make it and ask people to guess what the secret ingredient is. At any rate, it’s a wonderful chocolate cake to have in your repertoire, not to mention a great way to use up some zucchini if they’re starting to get the better of you in your garden. It’s definitely one of my favorites, and I even made it for my mother-in-law’s birthday a few years ago. It really is that good. My little girl will even tell you so now. Still looking for ways to use up tomatoes? Try Tomato and Goat’s Cheese Tart, Ravioli and Tomato Salad, Oven‐roasted Ratatouille, Spaghetti with Fresh Tomato Sauce or Spaghetti with Roast Cherry Tomatoes, Chili and Basil. I only make this recipe in the summer, when tomatoes are at their best. As such, it’s an ideal way to use up tomatoes from your garden if you’re overrun with them. I’ve tried making it in the winter, with those awful pale, hard, imported tomatoes that never ripen, and believe me, it’s not worth it. 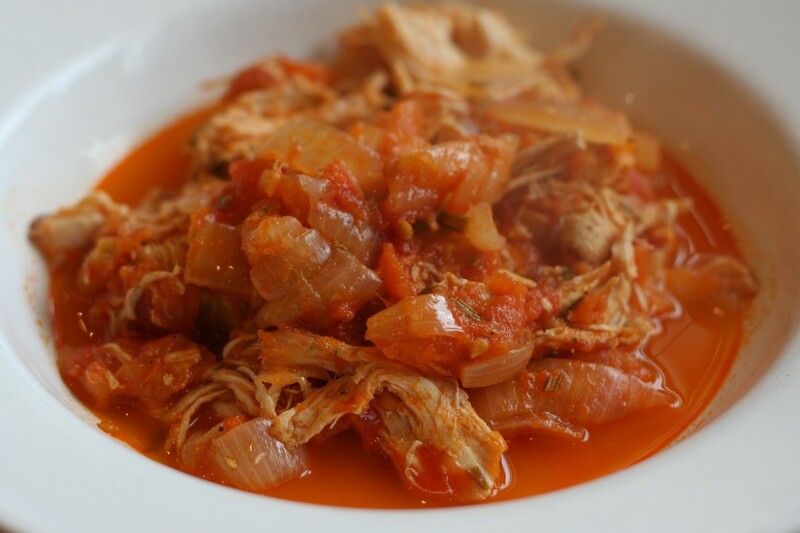 I’ve also tried making Nigella Lawson’s quick version of this dish, using canned tomatoes, but it was a disappointment after having had the real thing. The fresh rosemary is another key ingredient here. Sometimes I find it hard to peel tomatoes because they’re too hot after just being in the boiled water, even after I run some cold water over them, so if I think of it, I blanch them earlier in the day, then drain them and set aside to cool in the fridge and peel them when the onions are cooking. To get 3 1/2 lb (1.5 kg) of tomatoes, I used 14 medium tomatoes, so you can use that as a guide, give or take a couple. Heat the oil in a large pot over a medium‐high heat and season the chicken breasts liberally with salt and pepper. Add the chicken to the hot oil and brown well on all sides. Remove the chicken to a plate and set aside. Add the onions to the pot, lower the heat to medium and cook for about 10 minutes, until the onions have softened. Meanwhile, skin the tomatoes. To do this, cut a shallow X in the bottom of each tomato with a sharp knife, then pour boiling water over them and leave until the skin around the X starts to curl away, about 1 to 2 minutes. Drain and allow to cool, then slip off their skins. Cut into quarters or roughly chop them – it doesn’t matter too much since they’ll break up during the cooking anyway. When the onions are done, add the garlic to the pot and cook for 1 minute. Next add the wine or vermouth to deglaze the pan. Add the tomatoes, rosemary and bay leaves. Crush the tomatoes with the back of a wooden spoon as best you can (again, don’t worry too much about this, as they’ll break down on their own.) Add salt and pepper to taste and bring to the boil. Lower the heat and let the sauce bubble and reduce without covering to about half its original volume, which will take around 20 minutes. Add the chicken back to the pot, pushing the fillets down into the sauce so that they are mostly submerged. Cover the pot partway, leaving the lid slightly ajar, and simmer gently for at least 40 minutes (though I find 1 hour is even better). Stir the sauce now and then with a wooden spoon, crushing up the tomatoes as you do so. I like to shred the chicken in the pot with a fork, though you could also just serve them whole. Serve with pasta, rice or good crusty bread to soak up the juices. Preheat the oven to 350°F (180°C). Grease a 10‐inch tube pan or bundt pan and dust lightly with flour. Combine the flour, cocoa, baking powder, baking soda, salt, and cinnamon. Set aside. With a mixer, beat together the butter and sugar until they are smoothly blended. Add the eggs to the butter and sugar mixture one at a time, beating well after each addition. With a spoon, stir in the vanilla, orange zest, espresso powder and zucchini. Pour the batter into the prepared pan. Bake in the oven for about 50 minutes (test at 45 minutes), or until a tester inserted in the center comes out clean. Cool in the pan for 15 minutes, then invert and turn out on a wire rack to cool completely. To make the glaze, mix together the powdered sugar, milk and vanilla. Beat until smooth, then drizzle over the cake. Cut in thin slices to serve.